Phillip Meintzer (left), Philip Walsh (right) are doing research and development work on cod pots for the Marine Institute. It’s a great idea if you are curious about cod pots to show up on the day that the experts are on the wharf. Some days are just lucky. We recently toured the Wooden Boat Museum of Newfoundland and Labrador located in Winterton and part of the many excellent displays was about various fishing methods. Gill nets, cod traps, lobster pots and crab pots were explained or on display but they had no reference to the cod pot so, once again, I had something else to learn about. As we drove past Aubrey Payne’s Seldom stage last week, I mentioned to Leo that Aubrey might use pots. A couple of days later, we went past as pots were being assembled on the wharf and Aubrey was there on sight. We turned around and Aubrey encouraged us to come and check the pots out and we were able to learn even more than I had anticipated. Aubrey Payne on the water testing cod pots. Photo credit Phillip Mientzer. 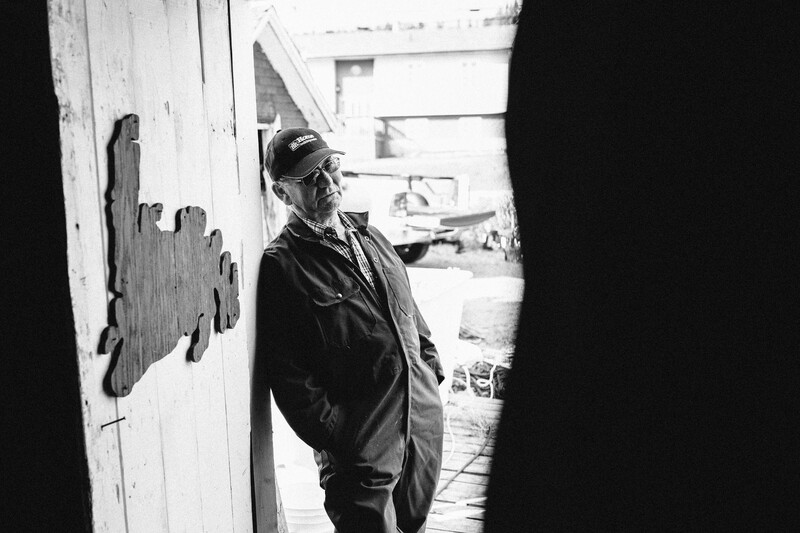 As well as using cod pots, Aubrey and his wife Marie also teach visitors to the Fogo Island Inn about the Cod Pot Cod served in the dining room. 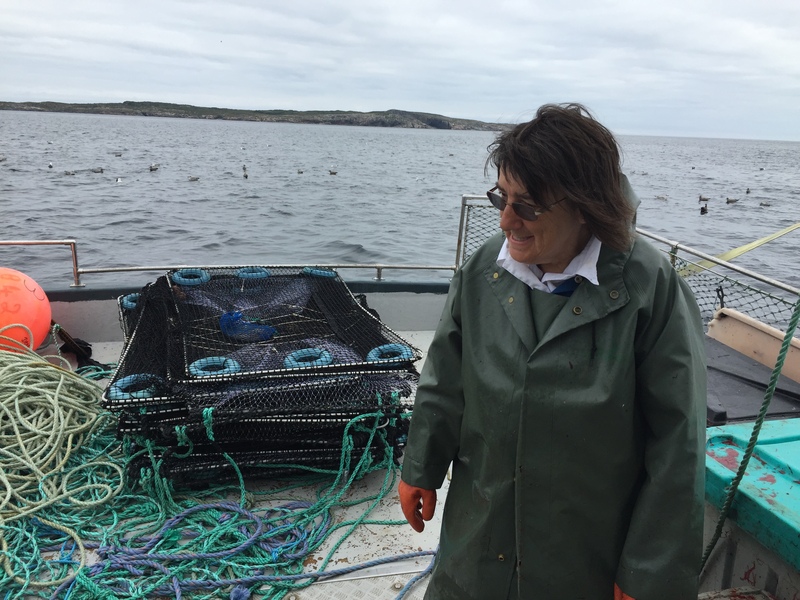 They greet Inn guests on the Farewell side of the ferry run and also give them tours of fishing equipment and methods used on Fogo Island. Marie Payne on deck with a collapsed cod pot in the back ground. Traps are collapsible for easy storage on deck. Photo credit Phillip Mientzer. Catching live cod in a pot is a fishing method new to Fogo Island. It’s a new technology being developed in Newfoundland. Since 2000 this fishery has been tried with a variety of modifications to the design of the actual traps. The purpose is to bring a higher quality fish to the wharf and to increase the value per pound in this way. Former methods, particularly gill nets, lead to damaged fish resulting in a lower price due to the quality. Fish is graded and price per pound depends on the grade that arrives to the buyer at the time of sale. Philip Walsh from Memorial University’s Marine Institute has been researching and designing cod pots since 2000 and is getting close to having the design finalized. On this day, with his research assistant,Graduate student Phillip Meintzer he was installing a camera to a frame around the pot to enable some filming of the fish interacting, and hopefully being caught in the pot. What a day to show up with a few curious questions! Aubrey is very interested in fishing with a cod pot. 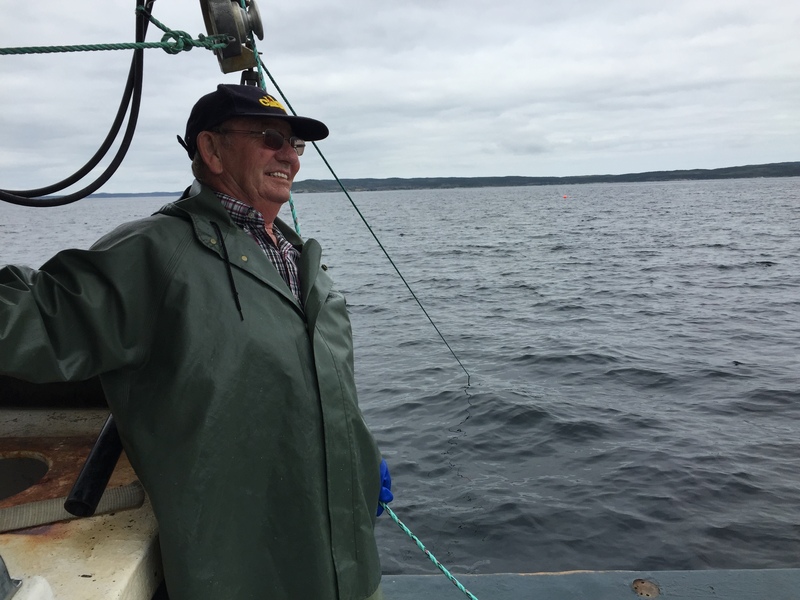 As part of the trials he’s watching closely and staying involved as the pots are used, assessed and modified to meet the needs and goals of the fishery. The pots are still very much in a research and development stage. 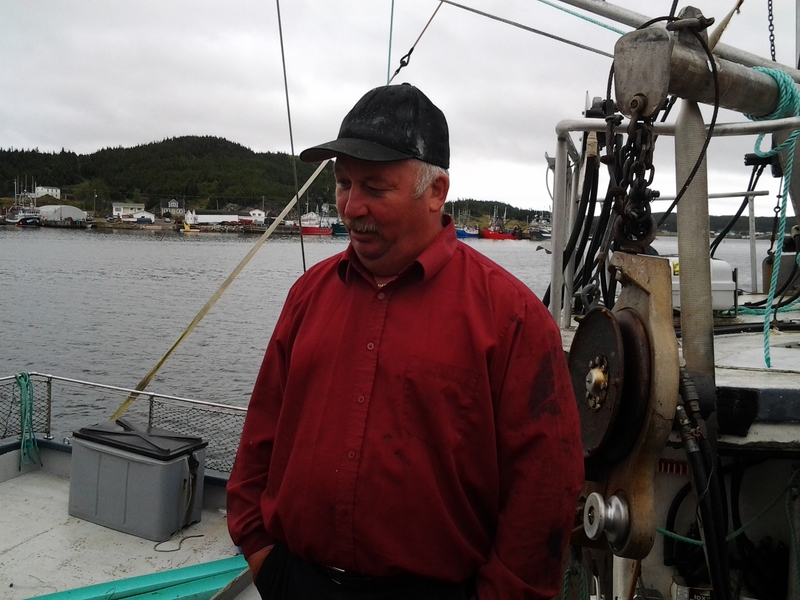 Rodney Budden was one of the first Fogo Island fishermen to try fishing cod with a pot and, when I asked him, was very frank in saying he didn’t think much of it a first. Once the correct placement of the pots was figured out and he saw the number and quality of fish caught, he was impressed and pleased. With modifications to the pot design over the years, he is now a proud advocate of cod pot fisheries and says he’s used his last gill net. Gill nets damage the fish and when they sometimes break loose and get lost continue to fish as “ghost nets” floating in the ocean and continuing to kill fish. Fish caught in gill nets are of a poorer quality and bycatch is also destroyed. 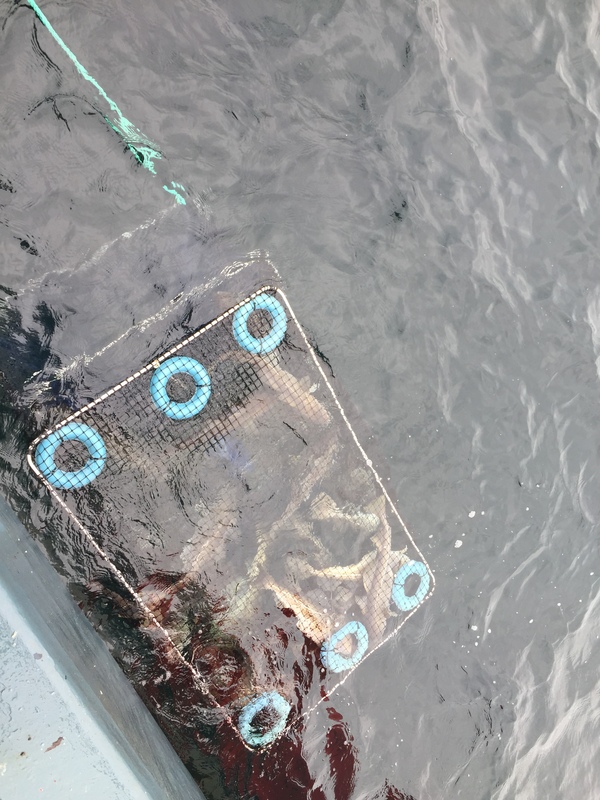 Rodney says with the cod pot, the occasional sculpin or crab might be found in the pots and they are released live. Fish from the pot is caught live. Fish in a gill net begins to deteriorate within hours of the fish getting tangled in the nets, therefore can be dead for hours before those nets are hauled. The cod pot fishery is a short 3 weeks following the Food Fishery. With a quota of 4100 lbs, fishermen want the best price possible and need top quality fish to ensure that price. Catching them alive is the best way to do this. Hauling live cod to the surface in a cod pot. Photo by Phillip Mientzer photographer and research student from Marine Institute. 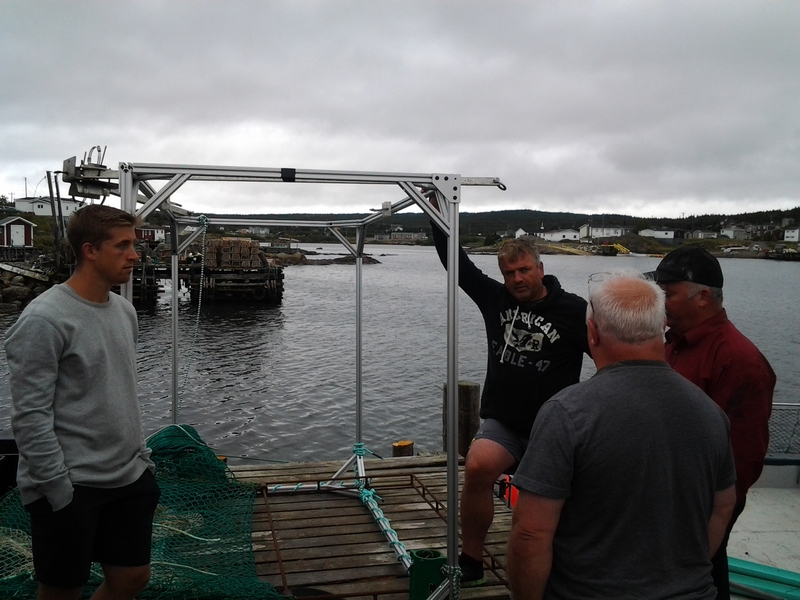 Innovation, research and development all ways the the Marine Institute and fishers can work together to manage and sustain fish stocks and increase quality and income. Thanks to the boys on the wharf for the great explanations to my very basic questions. Now I kow there’s no cod pots in Winterton because they are still being perfected in various locations around the province. I’ve also got a hint now if just what all those men on the head of the wharf might be talking about. Special thanks to Phillip Mientzer who shared information and personal and professional photographs with me after our visit. His professional photography can also be seen on his web page. http://www.phillipmeintzerphoto.com/ and thank you to Aubrey Payne who, with Marie, always greets us with a smile.